MELBOURNE, AUSTRALIA - Former Japan midfielder Keisuke Honda has signed with Melbourne Victory for the 2018-19 season, the A-League champions announced Monday. The former AC Milan player retired from international soccer after Japan’s exit from the last 16 at the World Cup in Russia, having represented the nation 98 times and scored 37 goals. Honda’s signing is a coup for Victory after the departure of stalwart striker Besart Berisha and a bonus for the Australian league, which has struggled to lure world class talent. “I’m so happy to join the club,” Honda, wearing a Melbourne Victory shirt, said from Los Angeles in an interview with local broadcaster Fox Sports. “I think Melbourne Victory is the best club in Australia. I am honored. I will make the club win. I have confidence, I will help the team as much as I can. While details of the contract were not released, Football Federation Australia, the national governing body, confirmed it would make a significant contribution to Honda’s multi-million dollar salary out of its marquee fund. “The marquee fund . . . was set up for just this purpose,” A-League boss Greg O’Rourke told a media conference in Melbourne. “We set out about three months ago with only two or three names (in consideration), one of those was Keisuke Honda. 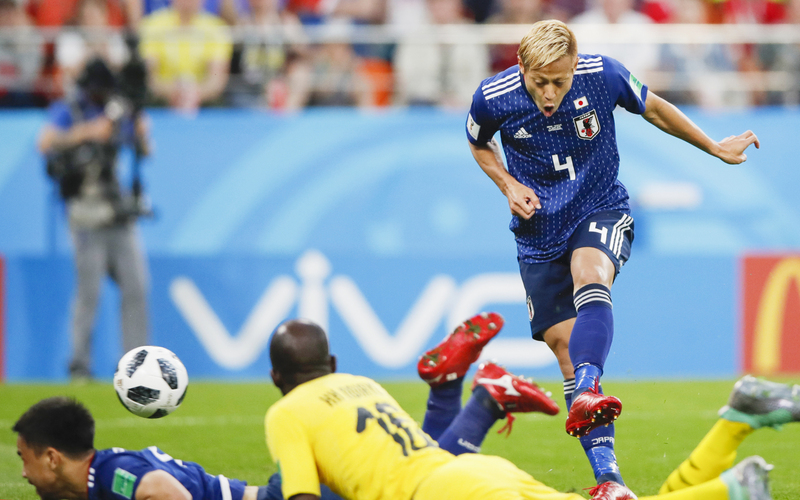 The 32-year-old Osaka native, a set piece maestro capable of playing across the forward line, underlined his class with a goal against Senegal at the World Cup, which made him the only Japanese player to score in three World Cups. He said his agent’s brother told him of Victory’s interest a week after the World Cup, but he had never thought of continuing his career in Australia. “I couldn’t believe that, because I am a Japanese and I never thought I would play in Australia in my career,” said the bleach blond playmaker, whose last club stint was with Mexican side Pachuca. “I checked a couple of things. Melbourne Victory is the most successful club in the A-league in the last 13 years, they became champions many times, I am proud of this kind of club. “Also the manager Kevin (Muscat), he (was) a really nice guy when I talked with him. Muscat coached Victory to a record fourth A-League title last season and said he was convinced Honda could make a big contribution. “He’s a hugely driven individual as no doubt many people have seen over the years in his career,” Muscat told reporters. “From a football side of things, who can contribute and contribute heavily to my team and the competition was the most defining thing for me. Muscat said Honda was a proven performer at the highest level and “we can’t wait to see what he can do in Melbourne. Victory will kick off its domestic season on Oct. 20 against Melbourne City.